The Legal Forum for the Land of Israel called today on the Israeli government to implement the findings of the Levi Report, after the EU issued directives forbidding its member states from cooperating, transferring funds, giving scholarships or research grants to bodies in Judea and Samaria, eastern Jerusalem , and the Golan Heights. 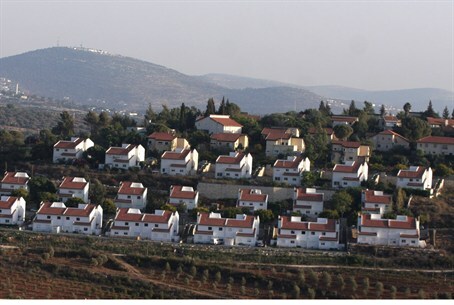 The Levi Report was commissioned by Israeli Prime Minister Binyamin Netanyahu, to examine the legal status of so-called "outposts" - nascent communities in the Judea-Samaria region. The committee was headed by former Israeli Supreme Court justice Edmund Levy, and found that - contrary to the claims of Israel's detractors - Israel's presence in Judea and Samaria is legal under international law. The EU directive in question was promulgated by the European Commission, which is the operative arm of the EU, and sets parameters for cooperation between the EU and its members states, on the one hand, and Israeli governmental and private elements on the other. The instructions are for the years 2014 – 2020 and will go into force on Friday, July 18. "In response to the EU Yesha [the Hebrew term for Judea and Samaria - ed.] boycott, Israel must immediately implement the Levi report and legalize all the outposts in order to establish that we are determined to realize our Biblical rights to our land. This boycott caters to PA libel and incitement, is contrary to international law, and attempts to challenge our legal presence in Israel." In contrast to, the far-left "Gush Shalom" organization celebrated the EU decision, comparing it to "a bucket of water poured on the head of a drunk," adding that, "from now on, should the government seek to sign agreements and maintain relations with the EU or its member countries, it will have to note officially that the agreement does not apply to the settlements nor to East Jerusalem." "The EU has started to confront the government of Israel - and every citizen of Israel - with a road sign that cannot be ignored. One path leads to peace with our Palestinian neighbours and the Arab countries, and to enjoying international esteem and sympathy. The other path - to war and more war, to being an international pariah. The time to choose between these two paths is running out." Such gloating by elements of the far-left will do little to discourage the sponsors of a bill, placing restrictions on what its supporters call "European interference" in Israeli government policy and sovereignty. Indeed, in response to the EU's directive, MK Ayelet Shaked (Jewish Home), one of the sponsors of that bill, called on to the government to respond by banning all money transfers from the EU to anti-Israel associations operating democratically within its jurisdiction, which she said regularly attempt to organize international boycotts of Yesha products and businesses.